Coffee is a part of many of our lives. It is the beverage we drink when we wake in the morning. It is the beverage we enjoy after dinner with our dessert. It is also the beverage that we drink when we are simply tired and need to be refreshed. Making a whole pot of coffee can be a nuisance, especially when you are the only one who will be enjoying it. A Keurig, which makes individual cups, can be more of a logical option that will allow each individual the chance to choose the type of coffee that they wish to drink. Which model is best for your needs? We have developed a list of some of the best options available as well as a budget-friendly Keurig for you to consider. To further assist your decision-making process, we have compiled a list of pre-purchase considerations as well. Our gold pick is the Keurig K575 Coffee Maker, which is a coffee maker that is also capable of brewing hot and cold tea, hot cocoa, and iced coffee. This model is 10.43 inches in length, 13.63 inches wide, and 13.45 inches high, so make sure that you have enough room to give this device a home. It is almost 14 pounds, which means that it is one of the largest Keurigs available for purchase. The Keurig K575 Coffee Maker can use the standard K-cup to make cups of coffee that are four ounces, six ounces, eight ounces, ten ounces, and twelve ounces. It can use Vue pods and K-mugs to brew cups that are 12 ounces, 14 ounces, 16 ounces, and 18 ounces in size. It can also utilize a K-carafe pod to make larger portions that are 22 ounces, 26 ounces, or 30 ounces. 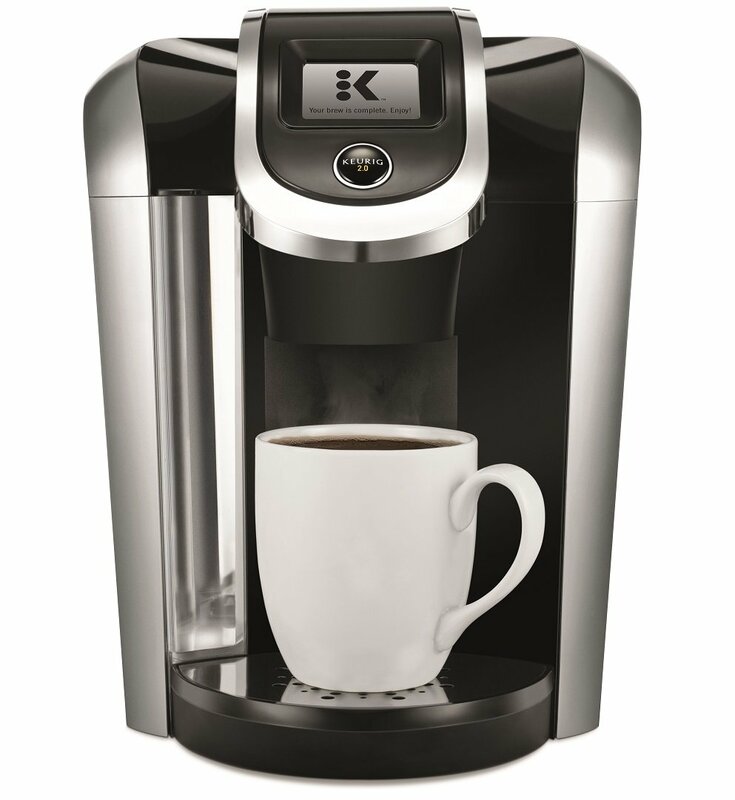 The system utilizes a new brewing technology to read the lids of each K-cup, K-mug, or K-carafe before it is brewed to make it perfectly to your liking every time. The unit features a large 2.8 inch touch screen display that makes brewing a cup of coffee a simple task. It takes less than a minute to brew a single cup of coffee, but it can take up to three minutes to brew a carafe. This unit has an 80 ounce reservoir that allows you to make several cups of coffee before refilling the tank. This large reservoir means that hot water is always available when you need it; in fact, there is a feature that allows you to simply dispense it. There are five different temperature settings that can be used, which makes it easy for you to have hot coffee in the morning and your kid can have hot cocoa that is not as hot as your coffee. In addition, you can control the strength of your coffee as well. There is an auto on and off feature that allows you to program the device to brew a cup of coffee and then turn off the coffee maker when it is complete. If you do not program the device to brew, there is an energy saver mode that will turn off the unit after about a minute or two. You can save your favorite coffee settings, brew a k-carafe that is ready in the morning when you wake, or have high altitude settings if you prefer. You can enable maintenance alerts, and set the device to English, Spanish, or French. The display features a digital clock that will help you know what time it is as you are getting your cup of coffee in the morning. It also features an illuminated reservoir that can also be used to light your way in the dark. The Keurig K575 Coffee Maker is only available in platinum, which is a great color to match any kitchen décor. Keurig K575 Coffee Maker also comes with a six pack of K-cups varieties for you to test out and see if you like any of them. If you do not like the options that come included, you can purchase one of the over 500 varieties available or you can purchase a Keurig 2.0 My K-cup reusable filter to use your own variety of coffee, coffee bean, or tea leaves. In addition, it also comes with a water filter handle and two extra water filters for when it is time to replace the current one. When it comes to reviews, this Keurig K575 Coffee Maker has almost 4,000 reviews on Amazon alone, and 59 percent of them are positive four or five-star ratings. One of the main issues that users have with this coffee maker is the fact that you can only use brand name Keurig K-cups, which still gives you a lot of coffee and beverage options to select from. Our silver pick is the Keurig K475 Coffee Maker, which is a model that is similar in size as our gold pick, with a length of 10.4 inches, a width of 13.6 inches, and a height of 13.4 inches. In addition it weighs about 13.7 pounds. This unit is perfect for making coffee, tea, and other specialty beverages that you may enjoy drinking. This unit is able to use a few different sized cups to brew coffee. It can utilize a K-cup to brew a four ounce cup, a six ounce cup, an eight ounce cup, a ten ounce cup, and a 12 ounce cup. It can use a Vue pod or a K-mug pod to make cups that are 12, ounces, 14, ounces, or 16 ounces in size. It can also make larger portions using a K-carafe, which makes cups that are 22 ounces, 26 ounces, or 30 ounces in size. If for some reason you do not like to use the traditional K-cups, the Keurig 2.0 My K-cup reusable filter is available to be used with this unit. It gives you the option of using your own brand of coffee or tea if you prefer to do so. The Keurig K475 Coffee Maker features a 70 ounce reservoir that can hold enough water to make several cups of coffee without the need to refill the tank at the sink. In addition, this water reserve is designed with an illumination feature that allows you to see the unit in dimly lit areas, which means that you can make a cup of coffee without turning on the lights in the morning if you wish. The unit is controlled using the 2.4 inch touch screen that is located on the top of the unit. Here you can control how strong you want your coffee to be as well as the temperature that you want it to be. There is an automatic on and off setting that allows you to program the coffee maker to brew you a cup at the specific time you set it to do so, and then after about a minute or two, the device will shut off. There is also an energy saving mode that you can enable. If you use the automatic brewing functionality, you can select a single cup serving to be made to your preferences or a full K-carafe can be made if more people will be enjoying coffee in the morning. In addition, there is a setting that will brew your coffee differently at high altitudes. This K475 features a location where the cord can be stored when it is not in use as well as a digital clock to keep track of the time. You can also set you language preference for the display to English, Spanish, or French, depending on the language that you are the most comfortable with. This coffee maker can be purchased in black, sandy pearl, or vintage red, so you can choose a color that is sure to match your kitchen décor. Our bronze pick is the Keurig K55 Coffee Maker, which is a smaller model than our first two picks by far; in fact, this model does not offer carafe options at all. It only is capable of using K-cups to make six ounce, eight, ounce, and ten ounce cups. It is a compact device that is 9.8 inches long, 14 inches wide, and 13.5 inches high, which makes it small enough to fit under most cabinets. It is also only about 12 pounds in weight, which makes it a more portable version as well. The K55 features a 48 ounce reservoir that is designed to give you the option of making several cups of coffee before it needs to be refilled. Cups of coffee can be made in three different sizes, which are small medium, and large. There is a button for each size to make it simple to see exactly which size you are selecting. In addition, this device is also compatible with the MY K-cup reusable filter, which gives you the option to use your favorite coffee beans in the unit. The controls are all manual buttons, but you can still program the device to prepare a cup of coffee for you at a certain time, which means it will be ready for you in the morning. If you forget to program the coffee maker, it only takes about 60 seconds to brew a fresh eight ounce cup of coffee. In addition, the drip tray is removable, which makes it easy to clean, but it also gives you more room to fill a travel mug with coffee for your commute to work. There is also an indicator light on this unit to walk you through the brewing process. If you need to add water to the unit, the light will appear. It will also let you know when the unit is on, when it is heating the water, and when you need to descale the unit. In addition, there is an energy saving mode that will automatically shut the device down when it is not being used. The K55 can be purchased in black and rhubarb, which are great color options for most kitchens. It also comes with a one year warranty and a 12 pack of different varieties of K-cups for you to sample. If you work a nine to five job, then you will need coffee in the morning to wake you from your slumber. Keurig coffee makers can be a bit on the pricy side, but there are single cup options that can make someone who is ballin’ on a budget a very happy coffee lover. Our last pick is the Keurig K-15 Coffee Maker, which is a compact device that is only 8.7 pounds. It is 10.7 inches in length, 6.9 inches wide, and 10.7 inches tall, so you will not have any issues fitting it in a tight space; in fact, this unit was designed for small spaces. The Keurig K-15 Coffee Maker is only able to make single cups of coffee, tea, or hot cocoa, but that is more than enough since it only takes about two minutes to fully brew or create a hot beverage. It uses K-cups to make drinks that are six ounces, eight ounces, or ten ounces in size. It is also compatible with the My K-cup reusable filter, so you can even use your favorite brand of coffee or tea if you desire. There is no water reservoir on this unit, so you will need to add a cup of water to the device each time you want to brew a cup of coffee, but the drip tray can be removed, which makes it simpler to fill up a travel mug if you want for your commute to work. There is no display, and the controls are simple to use. There is only a power button and a button to brew the coffee. The indicator light will walk you through the brewing process, and after 90 seconds, the unit will automatically turn off. 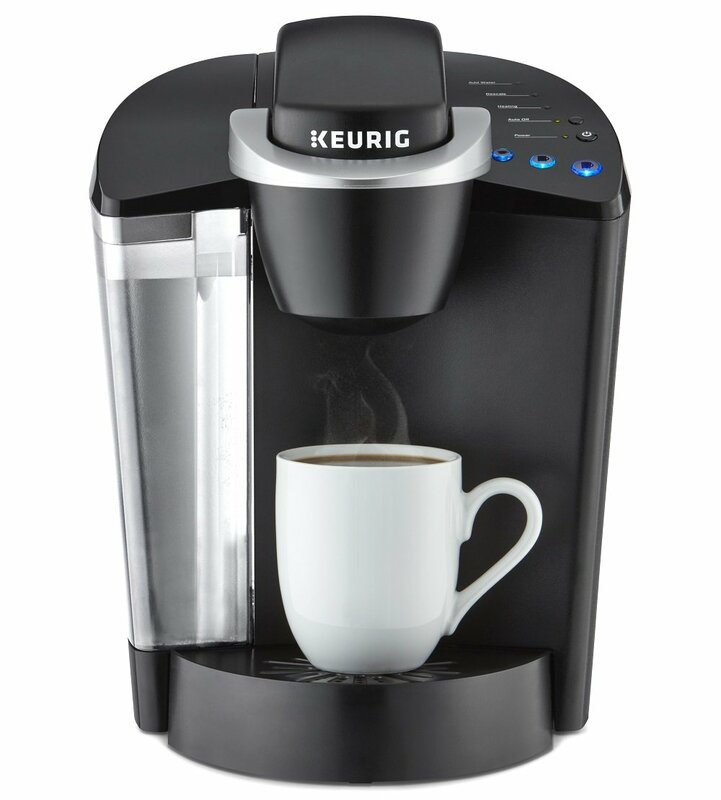 Most Keurig coffee makers can brew a cup of coffee in less than three minutes. This is a lot less time than many traditional coffee makers, but you can speed the process up by using warm or hot water in the reservoir. Some of the smaller Keurigs only brew one set size of coffee, but the majority of them allow you to choose how big of a cup you want. You can choose between four and 12 ounces per cup, but a larger cup may mean that the coffee is weaker than it would have been in a smaller cup. If you like a specific type of coffee or you like tea that is sold without the bag, then you may want to make sure that the Keurig you select is compatible with the My K-cup filter, which is a reusable device that you can fill with coffee or tea to brew and enjoy. A Keurig of any size will have a reservoir of hot water on hand. It may only be a cup full of water, but that is enough to make a quick cup of coffee. Other machines can hold as much as 80 ounces of water in their holding tank, which can be removed and filled at the sink any time you need. This extra large reservoir allows the machine to keep hot water on hand for drinks like hot tea or hot chocolate, but it also can provide you with hot water for oatmeal or ramen if you need. Some devices have a button to quickly dispense the hot water, while others require you to brew a cup of hot water. If the machine is going to be used a lot, then it may be beneficial to get a device with a plumbing kit that allows you to feed water to the device directly from the water supply, which makes those trips to refill the water tank non-existent. If you have hard water or water that does not taste the greatest, then you may wish to purchase a water filter kit to purify the supply. You want coffee in the morning to help you wake up right? With that being said, it is important to have a Keurig that can be programmed to brew a cup of coffee for you at a certain time. First, the smell will help you wake up in the morning, and since the coffee is able to brew itself, you will no longer need to fumble around the kitchen while you are half awake. Some machines are a little loud when they brew, but the majority of the Keurig family is enhanced with quiet brew technology that will not wake the other members of the household when coffee is being made. In addition, many of the Keurig coffee makers are designed to automatically turn off after a certain amount of time has passed to save energy. One of the reasons you are getting a Keurig is because you want to be able to get a fast cup of coffee, so make sure that the device is easy to clean as well. The last thing you need is a device that takes a lot of time to clean up. One feature that you should look for is a removable drip tray. The exterior should be easy to clean and the water reservoir should be able to be washed with a little soap and warm water. Before you make a purchase, think about the size of your kitchen and the amount of counter space that you have available to accommodate a Keurig before deciding which one is the best for you. You may need to get a machine that can fit under your cabinets or perhaps you want to set up a coffee station that is in another location with more space. Keurigs are great single cup coffee makers, but they are not always the best option for a budget conscious person. Decide which price range is good for you as well as the price of the K-cups before making a purchase. In addition, make sure to get the best Keurig coffee maker that has a warranty. Having the device covered for a period of time makes it more worth the purchase in the long run. 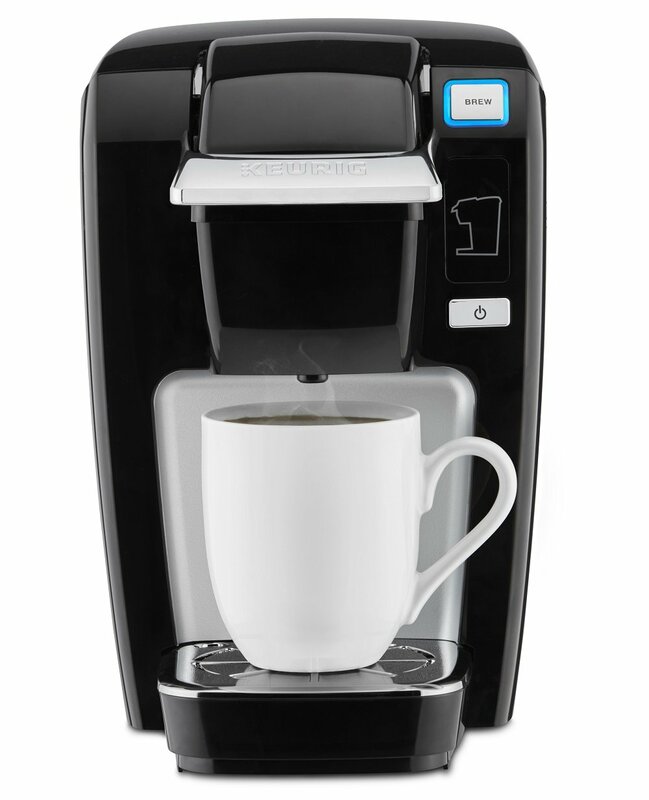 Owning the best Keurig coffee maker gives you the opportunity to make any flavor of coffee at any time during the day. You will get a single cup right when you want it that only takes a few moments to brew. If coffee is not your cup of tea, then you can purchase k-cups that will make you a hot cup of tea, a hot cup of hot chocolate, or even a hot cup of cider. The options are endless, so the first step is deciding what features you need your Keurig coffee maker to have. Take our top picks into consideration, and if they are not right for you, then there are plenty of options available. 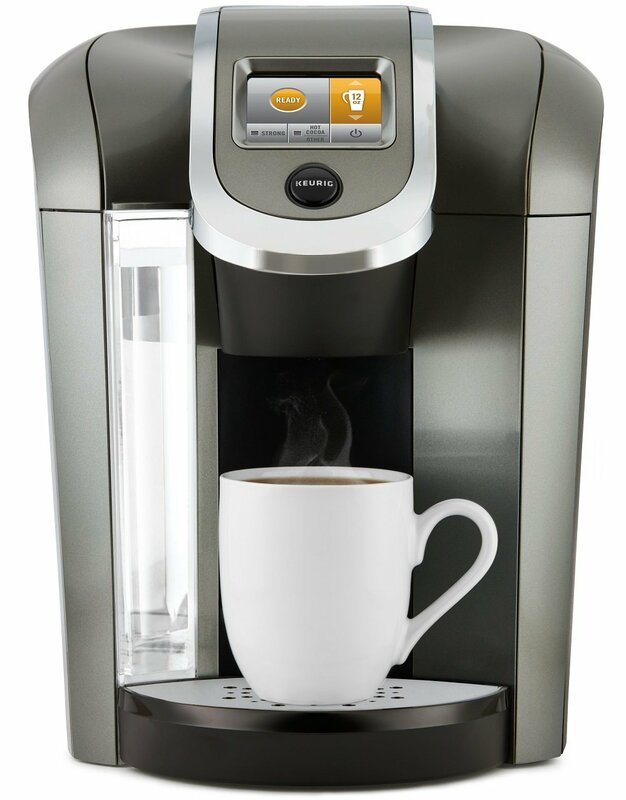 With a bit of due diligence, you will have a Keurig making hot beverages for you on a regular basis in no time.